Canadian poet and spoken-word/turntable artist Wayde Compton's first collection of essays explores complicated issues of race, identity and language. Indeed, the conjunction of literary innovation and language of and about race is something Compton knows a great deal about. In fact, Wikipedia and Urban Dictionary credit Compton as having coined the terms Halfrican and Halfrican American in "Declaration of the Halfrican Nation," a poem included in his bookPerformance Bond (2004). Curiously, Rush Limbaugh, as well as other radio and TV personalities, embedded Halfrican in the American vernacular when they used it to describe Barack Obama during the 2008 U.S. presidential race. In the book’s most trenchant essay, "Pheneticizing Versus Passing," Compton presents several case studies of racial misassignment (Black to Native, Native to Asian, Asian to White and White to Black) and uses these to investigate the meaning of and differences between passing ("deliberately misrepresenting oneself racially") and pheneticizing ("racially perceiving someone based on a subjective examination of his or her outward appearance"). Perhaps the most startling story is that of Anthony Ekundayo Lennon, a man of Irish heritage who, even as a child, was mistaken to be of "mixed-race," despite the fact that he has blue eyes and has never claimed to be anything but Irish. (With a twist of irony, one that Compton doesn't mention, Lennon's experience puts spin on the already ambiguous epithet "black Irish.") Among a group of actors, gathered to talk about "being black" in Britain, there is unanimous disbelief of Anthony's disclaimer that he is not black. Reactions range from anger to bemusement, and finally, an uneasy acceptance, based, it seems, upon the incontrovertible fact that Anthony "can't get white parts." All of Compton's case studies show race to be "a folk taxonomy; a pseudo-scientific demographic categorization system. Like a national border or literary genre, race is only as real as our current social consensus." When assigned through pheneticization, it's a trope; it always fails as science. 1. To make the voiced poem an art-object, outside of my body. 3. To view my own poem as an external or found sample, and even as an object of détournement. When this subversive process is successful, it generates new meanings as well as fresh understandings of old ones. 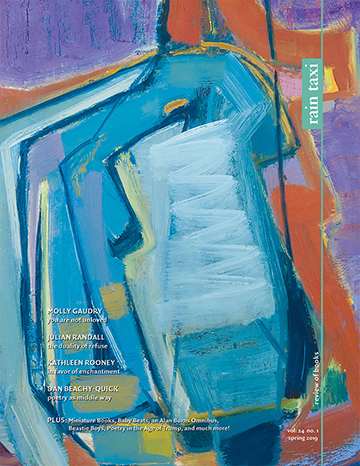 Art and literature relinquish essence for something richer and more complicated. Race and class must undergo the same demystification and reconfiguration. As the author explains in "Pheneticizing Versus Passing," "If there is no metaphysical definition of race, as Anthony's Derridian blackness seems to prove, then there is no means to measure or stabilize it. Depending upon your depth of investment in race as a notion, this is either frightening or freeing." "Seven Routes to Hogan's Alley and Vancouver's Black Community," one of Compton’s more Vancouver-centric essays, is sited in, can be sighted in (there are visual elements), and cites a particular neighborhood, a three or four block area in the East End/Strathcona section of Vancouver. Despite this more parochial point of view, many of the author's observations about his project of "cultural recovery" can arguably be applied to other locations and instances of artistic production, historical documentation and cultural memorialization. Photos of the Hogan's Alley Memorial Project's installation, in conjunction with the Vancouver Flower Brigade, of a sign "Hogan's Alley Welcomes You" spelled out as "floral graffiti" on a strip of green space below a highway viaduct, follow and complete the essay. This record of what may be a transgressive act of neighborhood beautification recalls an earlier series of photos Compton staged of make-believe historical sites, "Lost-Found Landmarks of Black Vancouver" (Performance Bond). Referring to that earlier work, he says that the "photographic section is, as far as I am concerned, a poetic device." History and metaphor cross over one other as the Hogan’s Alley photos now record a real, albeit transitory or seasonal, landmark. The overriding themes in Wayde Compton’s poetry, performance art, and academic and theoretical writing are hybridity and border crossing. 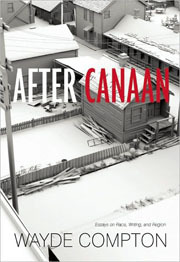 In the Introduction to After Canaan, he says that "looking to the margins rather than the centres has a unique value" because on the periphery "where there are fewer local expectations of what 'the black experience' ought to be, radical experiments of identity can be tried" and "new systems of thought against racism might be expected to emerge." These essays are, first and foremost, essays of ideas rather than style, and Compton’s ideas are always fresh and often downright exhilarating.